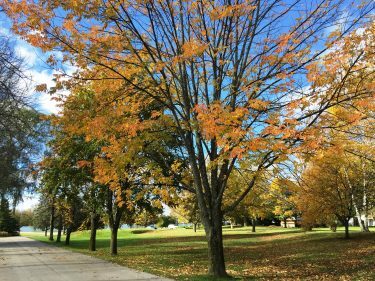 It is officially fall in Door County and it’s a wonderful time to visit. Our summer season is peak time for visitors but our next busiest season is fall. Fall in Door County is absolutely beautiful here. We’ve had really warm weather to start off the fall but it is now cooling down and getting to be the more average temperature we come to expect at this time of year. With fewer people, a Door County Fall lodging trip is the perfect time to get your escape in. Door County fall lodging at The Lodge is ideal for a romantic getaway with your sweetie. Or what about a guys or gals weekend to reconnect with friends? Almost all of the golf courses in Door County are open for those who love to golf. If you love to fish, our marina is ready for your boat, or charter a fishing outing right out of the marina. Our location is perfect to get to all the activities you enjoy. If shopping is your entertainment then you’re in luck. At this time of year, the shops are all still open and many are starting to offer discounts. This can make your trip an even better value and allow you to spend more on other items. If you enjoy more outdoor activities try your hand at paddle boarding or kayaking. Hike into any one of our 5 county parks or head out to one of our unique nature preserves located all over Door County. Once you’ve enjoyed the day, head back to The Lodge where you can retire at your Door County fall lodging resort. With our on-site dining, two lobby areas both with fireplaces or your suite you can relax and wind down to a comfortable evening. October 6th & 7th – Fall Lighthouse Festival: The 2018 Fall Lighthouse Festival includes boat excursions and guided land-based tours spotlighting historic Door County, Wisconsin lighthouses. For tickets and more details, please visit DCMM.org. October 27th – Thrills on Third: A day of festive Halloween fun for the entire family! Activities include pumpkin painting at 9 am, haunted house, games, science experiments, and trick-or-treating from 1-3pm in downtown Sturgeon Bay. The Costume Parade begins at 1 pm from Martin Park, 207 S. 3rd Avenue to the Clock Tower on Third, where Costume Contest winners will be announced. We’d love to hear from you. Be our Door County fall lodging guest this season by calling us at 920.743.5555 to schedule your beautiful fall getaway to Door County.